4th Book Giveaway — "The Teaberry Strangler"
3rd Book Giveaway — "The Teaberry Strangler"
2nd Book Giveaway — "The Teaberry Strangler"
While roaming around the Florence (KY) Antique Mall recently, I spotted this pretty pink vintage teapot. I picked it up and discovered it is a Sadler, made in Staffordshire, England. Well, anyone who knows me very well, knows that traditional round shaped English-made teapots are my absolute favorite. So, guess what? This pretty hand-painted vintage Sadler teapot came home with me! Congratulations to alinvilleblue. You won the fourth copy of THE TEABERRY STRANGLER by Laura Childs. I will send the four winners names and addresses to the author. Watch for your autographed copy to arrive in your mailbox. Thank you to everyone for the comments and participating in this generous giveaway provided by the Tea Shop Mystery series author, Laura Childs. I want to say a very special "thank you" the author for the generous giveaway of FOUR copies of "The Teaberry Strangler". This is the 11th book in the Tea Shop Mystery series and recently made the New York Times Bestseller list. Make a comment on this post by 11:00 pm on Saturday night to enter this drawing. All comments from the past three giveaways will be included in the drawing (except for the winners, of course). Therefore, you will have an entry for every comment you have made on the book giveaways this week. If you posted a comment all four days, you will have four entries, three days of comments = 3 entries, two days of comments = 2 entries, and one comment = 1 entry. All four winner's names and addresses will be sent to the author who will mail copies of "The Teaberry Strangler" to the winners. THE TEABERRY STRANGLER — Martha E.
All four winner's names and addresses will be sent to the author, Laura Childs, at the end of the final drawing. Did you know that Laura Childs is actually the pen name for the author, Gerry Schmidt? 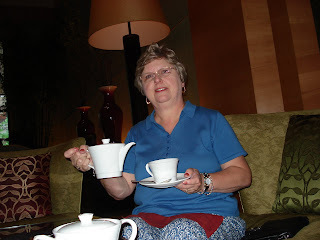 And, did you know she does all her own tea research for the Tea Shop Mystery Series of books? There is a list of tea resources at the end of "The Teaberry Strangler". These include tea publications, websites , tea vendors and tea blogs. Many of the resources the author used for the tea and recipe research in this book are very familiar to readers of my blog. Thank you for the comments on the 2nd giveaway mentioning a favorite tea food. 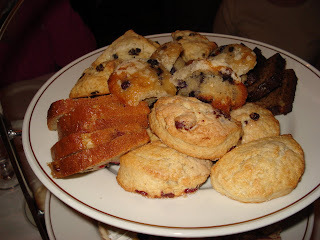 And, Martha E. did not win because she likes my Southern Cream Cheese Scone recipe!! It was a random drawing. However, I promise to post the recipe here soon! Leave a coment on this post before 11:00 p.m. Friday night to enter the drawing for the 3rd copy of "The Teaberry Strangler" to be given away. Please mention a favorite tea you enjoy drinking. The winner of the first copy of THE TEABERRY STANGLER chosen by random.org is — Valerie Zagami of Tea and Trinkets Blog. Congratulations Valerie! I will email you for your mailing address. I will send the names and addresses of all the four winners to the author at the end of the drawing. She will autograph and mail the the books to the luck winners. 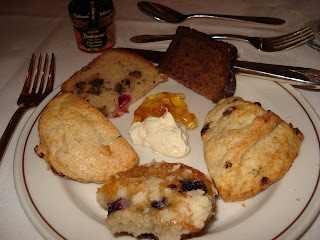 In addition to a great tea mystery, the author, Laura Childs, also includes recipes of foods mentioned throughout the book, and a list of theme tea ideas with menu suggestions. 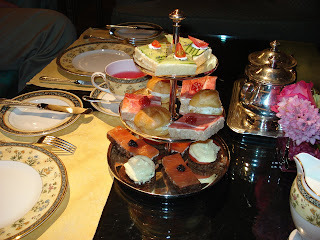 Do you have a favorite tea sandwich, savory, scone or sweet you enjoy with afternoon teas? Please leave a comment before 11:00 p.m. Thursday night and we will draw the 2nd book winner! 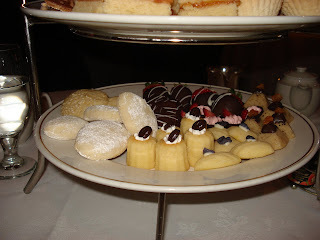 Laura Childs, author of The Tea Shop Mystery series contacted me to request a review of THE TEABERRY STRANGLER, her 11th book in the Tea Shop Mystery series released on March 2, 2010. And, she has offered a very generous giveaway to readers of this blog. See details at the end of this post. "It was the Dickensian evening Theodosia Browning had hoped for. Flickering candles lined the narrow cobblestone alleys of Charleston as shop owners, dressed in cloaks of yore, threw open their back doors to shoppers. Visitors took advantage of bargains on antiques, heaping bowls of crab chowder — and of course Theodosia's delicious teas. But when the clock strkes ten, the alleys clear except for one body discovered by a horrified Theodosia. It's the strangled form of Daria, the map store's owner. Many locals have shown interest in buying her shop — but enough to kill? Plus there's been a customer hell-bent on getting his hands on a certain not-for-sale map. In this case one can hardly throw a scone without hitting a suspect. Most alarming of all the theories, however, is Detective Tidwell's: that the killer mistook Daria for Theodosia herself. And if that theory holds water, the killer's work isn't done..."
This is a quick-read, fast-paced mystery with many tea references, a sprinkling of fun and elegant Charleston social events, and lots of information on the Charleston area historical attractions and geographical locations. While reading the many references to tea and afternoon tea foods in this book, I felt like I was in Theodosia's Indigo Tea Shop with Drayton brewing tea and Haley whipping up delicious finger sandwiches, savories, scones and sweets in the kitchen. Many of the recipes are included at the end of the book. Oh my! What fun for a tea-lover like me! The storyline was good and the author kept me guessing right up until the end of the book as to the identity of the murderer! 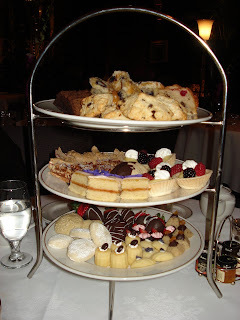 If you enjoy mysteries and/or tea, I believe you will enjoy reading THE TEABERRY STRANGLER!! Laura Childs, the author, generously offered a giveaway of FOUR copies of "THE TEABERRY STRANGLER" to readers of this blog. I will hold four drawings over the next 4 days. I will announce the winners here and contact each winner by email for a mailing address. At the end of the giveaway, I will send the names and mailing addresses of the winners to the author, and she will mail an autographed copy of the book to each winner. To enter the first drawing, please leave a comment to this post from now until 11:00 p.m. Wednesday, March 24. You will have an opportunity to enter the daily drawings until 11 p.m.on Wednesday, Thursday, Friday and Saturday. 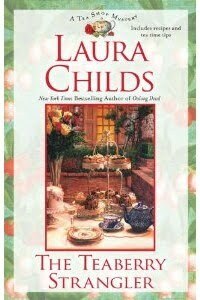 Have you read any of Laura Childs Tea Shop Mysteries or her other books? You can learn about her books here. Do you enjoy visiting the Charleston, SC area? My aunt and uncle lived in Mt.Pleasant for many years(mentioned in this book). My family has visited the area numerous times. Charleston is one of our favorite southern cities. Learn about Charleston here. 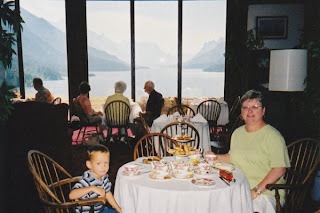 is our family's choice for "afternoon tea with the best view." 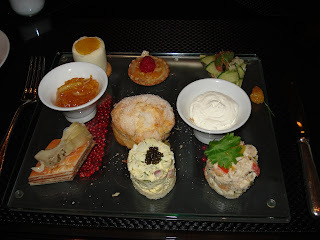 of this afternoon tea experience. Waterton Lakes National Park is the Canadian extension of Glacier National Park. We had tea on two different afternoons. 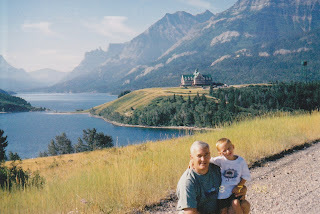 photo below on Waterton Lake? I'm not a big fan of "Tea For One" sets, but I really like this one! First, I love shamrock pattern for the month of March. Second, it is not the usual huge, clunky "Tea For One" set most of us are familiar with. This set is made by DJB Ceramics in Staffordshire, England and is fine bone china. The cup is actually the size of a delicate teacup. The milk jug and sugar bowl are the perfect size for one serving. The bottom photo shows the set compared to a normal-sized mug. Will you join me for a cup of tea in celebration of St. Patrick's Day? AJ completed his homework in record time on Tuesday afternoon so we could have time to go to the theater to see the 3-D version of Alice in Wonderland, the delightful Disney production of the Tim Burton movie just released in theaters on Friday. AJ and I declared this fun movie a winner! He loved the 3-D and I'm a major fan of fellow Kentuckian, Johnny Depp. Thank you to my "tea friend" Phyllis Barkey for sharing her photos and menu of a delightful Mexican-themed "Dinner for Eight" she and her husband hosted at their Michigan home Sunday evening for several new couples in their church. Phyllis' menu included a Mexican Savory Cheesecake garnished with chunky salsa and served with Tortilla Chips, Tortilla Soup, Chicken Rotel served with Mexican Cornbread, and Fried Ice Cream. 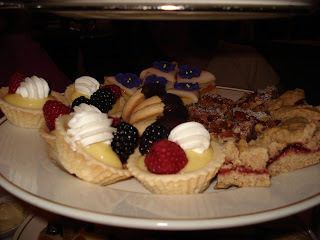 The beverages served were Chocolate Raspberry Truffle Tea and Non-Alcoholic Margarita Punch. I just love the the tablescape using festive dinnerware, a red table cloth, placemats and napkins, and (my favorite) sunflowers in the blue glass vase! Phyllis, thank you for sharing! Your themed tablescape and the act of opening your home to share your hospitality with others are inspirational to me! I hope everyone will enjoy these recipes. To poach chicken, place halves in a 4 qt. pan and completely cover with cold water by 1 inch. Add 1 chopped carrot, 1 stalk of chopped celery and 1 medium onion, coarsely chopped. Bring ingredients to a boil. Reduce heat to a simmer and cover, cooking for 15 minutes. Turn off heat, allowing chicken to finish cooking in broth for another 15 minutes. Remove from pan, and when cool enough to handle, cut into small pieces or shred. Strain cooking broth [discarding vegetables] and reserve for soup. Heat one to two teaspoons of vegetable oil in skillet. Saute onions and garlic in oil until tender. Stir in spices, tomatoes, Enchilada sauce, and reserved chicken broth. Bring to a boil, reduce heat and simmer 10-15 minutes. Stir in corn, chicken, black beans, and green chilies. Simmer 15 minutes longer. Meanwhile, preheat oven to 400 degrees. Lightly brush both sides of tortillas with vegetable oil. Cut tortillas into 1/2 inch strips. Spread in a single layer on a cookie sheet and bake until crisp -- about 15 minutes. I'm so happy I could contribute a little bit to the success of this dinner by providing my recipe for non-alcoholic margarita punch. Stir together first 4 ingredients. Stir in soft drink and serve immediately over crushed ice. Yield 1 ½ gallons. I use a pitcher to serve. Thanks again, Phyllis, for allowing me to share your beautiful tablescape, menu and recipe for Tortilla Soup! Note: I apologize for the spacing problem in this post! A new book in my tea library, The Essential Tea Companion Favorite Menus for Tea Patries and Celebrations by Victoria, was published in 2009. This hardcover book includes the best photos and recipes from previously published Victoria books, The Charms of Tea, The Pleasures of Tea, and The Art of Taking Tea. The book includes theme tea and menu planning ideas, a list of sources for tea and tea accessories, and a guide to afternoon tea places in the USA and abroad. The guide is a bit outdated, but I've never seen one that is not, in my opinion. If beautiful tea photos insipre you, as they do me, you will find this book a nice resource. Our first Cream Tea experience was at the Small Talk Tea Room in the beautiful village of Broadway located in the Cotswolds in England. 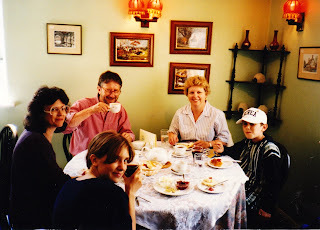 In the photo above, the Gledhill family, who had learned of my interest in afternoon tea, hosted GJ and me for our very first and most delightful Cream Tea. For those who may not be familiar with "cream tea", it is a pot of tea served with a Scone, Clotted Cream and Jam (usually strawberry). 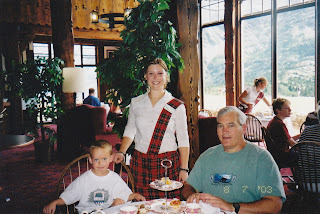 Thank you Gledhill family for teaching me about the English Cream Tea on tour first trip to the Britain with the Berea Festival Dancers. The Cream Tea experience has been repeated numerous times on many trips to England after 1995. What a delightful tea journey it is been! 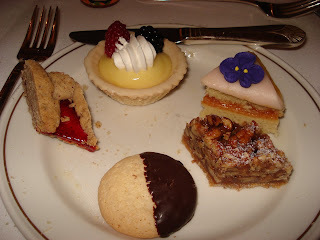 Asheville, NC is a great place for a "Girlfriend's Getaway"
The Netherland Plaza is one of our favorite grand hotel afternoon teas. 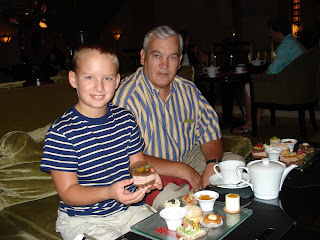 Although we had stayed at the hotel and been there for various events over the years, these photos were taken on our first family afternoon tea at the Netherland Plaza celebrating my birthday in 2008. 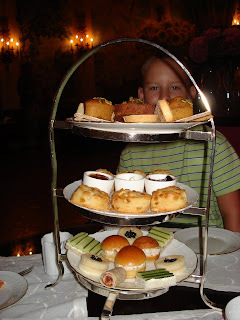 Since then we have enjoyed several holiday and family afternoon teas at the Netherland Plaza. Note to my family: Hint! Hint! My birthday is just around the corner! of the Ritz Carlton in New York City July 2007. 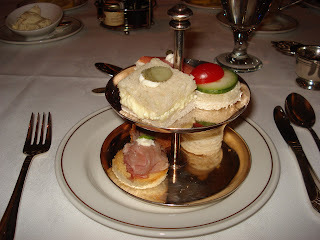 The first course was served on a small silver 3 tier server. This was a selection of delicious sandwiches and savories. After we ate those, the tea specialist (server) asked if we wanted more. 8 year old AJ requested more of 2 different sandwiches. Note: Several, but not all, Grand Hotels offer to replenish. Devonshire cream and Orange Preserves from nearby Sarabeth's. was served on the mini silver 3 tiered server. 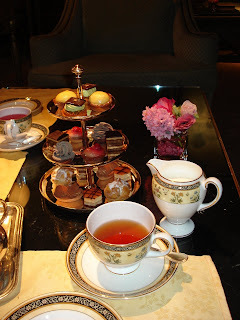 This was a delightful afternoon with unlimited pots of tea! Afternoon Tea at that time was served in the Rotunda. the edible gold on the chocolate pastry.